“I got a chance to live two lives in course of one. The first life was given by God but Bindeshwar Pathak gave me the second life,” says Usha Chaumar a former-manual scavenger and now a President of Sulabh International. In India, manual scavengers, who clean dry latrines, face severe social discrimination as they belong to the lowest strata of society who were known as ‘’untouchables’’. In 1993, India banned the employment of people as manual scavengers. In 2013, Manual scavengers act was passed which seeks to reinforce this ban by prohibiting manual scavenging in all forms and ensures the rehabilitation of manual scavengers. Despite progress, manual scavenging persists surreptitiously in India. Usha is also a manual scavenger. Like other manual scavengers, she comes from the family of the Dalits. She used to pick up human excreta from dry latrines . Usha started doing this work from the age of seven. ’’My mother used to take me with her when she use to go for work so that I could also learn, as later I had to do the same work, ’says Usha. Usha said, ‘’It was dirty work, and the smell of the excreta used to drive me mad. I used to get headaches most of the time”. She added that one of her colleagues lost her eyesight due to this work. Sanja Chaumar, former-manual scavenger said,’’ Women manual scavengers are more as compared to men’’. Usha added that this work is going in their families since generations. She said that they were humiliated and insulted even by those in whose houses they went to clean dry latrines. They had to clean human excreta with bare hands before sunrise so that nobody could see them or touch them. There was a time when they were made to wear bells around their necks so that on hearing the sound, people could stay away from them. Even while giving them food or water, people would maintain a safe distance from them. The doors of education and religion were closed to them: they were not entitled to enter school or temple. Manual scavengers could not draw water from the wells or ponds, they had to wait for a good samaritan to arrive at the place to draw water and fill their pitchers. Their pitchers were mainly made of iron to distinguish them from those made of clay used by upper-caste people. Usha said they took up this job of cleaning other people’s toilets, just for the sake of their children. She said they use to get Rs.10 per month from each house till 2003. Usha added that no government official or high-caste people ever told them that manual scavenging is banned in India. 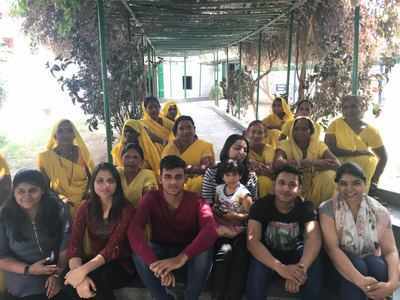 Dating back to 2008, Usha remembers that after doing her work she was relaxing in the open with her colleagues when Bindeshwar Pathak, a sociologist and founder of the NGO Sulabh International visited them and asked them why do they do this job? Pathak explained to them the ill effects of the job and urged them to give it up. He promised a job through which all of them could earn their livelihoods. Pathak brought all the manual scavengers from Alwar to Sulabh International and taught them the importance of hygiene. Almost 200 women, who previously worked as manual scavengers have been rehabilitated and trained as beauticians or in food processing, sewing or embroidery. They have also taken up courses in personality development. They run an association called ‘Nai Disha ‘in Alwar. Usha says now in Alwar, Pathak has constructed ‘Sulabh magical toilet’ i.e. two pits pour flush ecological toilet. This toilet does not need scavengers for cleaning the pits or disposal of sludge. This can be done by the householder itself. This toilet is affordable and easy to construct with the locally available material. This toilet is free from health hazards and does not pollute surface or groundwater. It produces available rich fertilizers and soil conditioners. This fertilizer can be used in the fields to raise productivity or it can be used for plants, fruits and flowers. Usha says, “I love my job, my life is good and happy we are loved and respected here. There is also change in society’s attitude towards us”. She says many people who treated us as untouchables earlier are now our regular customers they buy papad from us. They get the parlor work done from us. We visited Paris a few months ago, we have met several stars. Recently a person from different caste invited Usha to his daughter’s wedding. The same person accepted a gift from her and allowed her to dine with his family members.